We’ve praised Samsung over the past few years for its all metal and glass designs, but I’ll be real with you, I’m starting to get bored with it. The Galaxy S8 and Galaxy S9 are nearly identical, with the Galaxy Note 8 being just a larger phone with the same design. Point being, while they are great looking and feeling phones, it may be time for something new, dare I say drastic with regard to design change. This week, we could be getting our first look at what to expect from Samsung later this year in the Galaxy Note 9, thanks to recently posted CAD images from Onleaks and 91Mobiles. 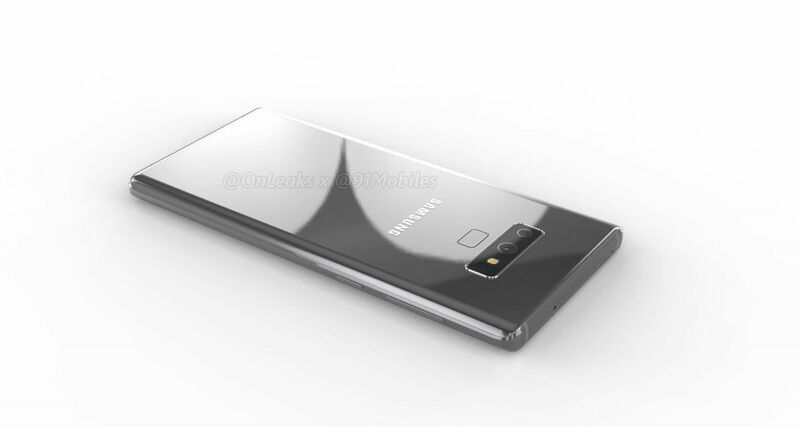 If you’ll recall back to last year’s Note 8, Onleaks was nearly spot on with early CAD renders, so there’s no reason for us to believe the Note 9 will differ greatly from what we’re seeing above in the header image and below in the full video. From what we can see, the phone will have a horizontal dual camera setup, with a separated fingerprint reader placed below. This differs from the current vertical dual camera setup on the Galaxy S9+. On the bottom we see a USB-C port, 3.5mm headphone jack, as well as the speaker. For buttons we have a volume rocker and Bixby button on the left, plus a power button on the right. As for the front, we see a large Infinity display with minimal bezel. So, yeah, it’s a Galaxy Note 8 with a switched up camera module. Like I said, I’m already bored with this. Don’t get me wrong, I’m sure the Galaxy Note 9 will be an insanely cool device with features bursting out of its metallic and glass body, but dang, I was hoping for something a little different. Here’s hoping we see a design switch with the Galaxy X or S10 or whatever they’re going to call it.